With the advent of fire arms, the need of heavy armor for hand to hand combat was reduced. Swords grew smaller and lighter. Hand guard grew out of quillions, and gloves came out from beneath gauntlets for hand protection. 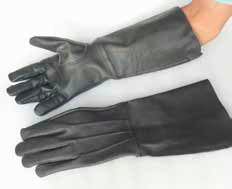 These undecorated leather gloves not only serve for hand protection the also allow for a better grip of you hilt. A person could add their own custom embellishment if they chose. This page was last modified on 4 May 2014, at 15:57.